If you've been reading my blog for a while, you will know that I seldom take on media invites that have anything to do with food tasting. Come to think of it, I can count how many I've done over the years with just one hand. Besides not having the passion to be a food blogger, I also get a mental block when coming up with adjectives to describe food. Delicious, yummy, appetizing, juicy, tender, sumptuous. That probably makes up my entire list of words. When Timbre wrote in to invite us to their Saturday Social BBQ, it was a different story altogether. Firstly, BBQ! I totally love having barbeques and there's something finger licking good about barbequed food that can't be substituted. Right, we'll think about the calories later. 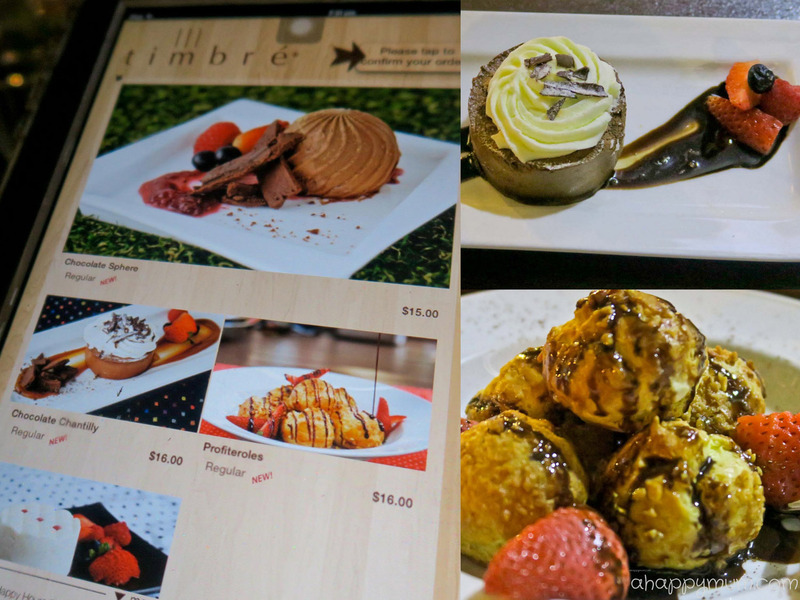 Secondly, I never thought of Timbre as a family-friendly restaurant so it was tempting to find out just what activities were in store for my kids. Lastly, it isn't that easy to find a eatery that is off the beaten track and comes with a cosy ambience, live band and good food. So, we decided to give it a try and we were sure glad we did. Located in Gillman Arts Centre, Timbre @ Gillman is surrounded by lush greenery and offers a small indoor air-conditioned bar area and a huge alfresco dining area. The outdoor area is well ventilated, sheltered and has a a rustic furnishing that gives it a homely feel. I personally liked the BBQ aroma that was in the air which made me crave for the food more and couldn't wait to settle down. It took me one hour to do so, I'll tell you why later! I checked out the toilets and even though they were not the cleanest we've seen, the cubicles and washing area were decent and at least there was a changing table, which matters much if you have a baby with you! We were also surprised to see a table tennis table right outside the toilet and there were racquets and balls at the side too for guests to make use of. Now, this is my favourite part of Saturday Social BBQ! Even though it takes place every week, there is a different theme each month so you can be sure to visit and re-visit and the kids will be entertained with different games and activities! How cool, right? We actually wanted to visit in March because the theme was Dr Seuss' birthday and my girls are such fans of his books. I read that kids were able to participate in Cat in the Hat crafts, origami Fish folding and story telling too! Alas, when I tried to reserve a slot for us at the start of the week, they were already totally booked! Seriously. This shows just how popular Saturday Social BBQs are with families so if you are planning to go there, do reserve in advance. Anyway, the theme for April was something quite interesting too - Spies! I thought that would be a change for my girls and something exciting to look forward too. In accordance with the theme, the decorations and activities vary and you can see how much effort has been put in. When we arrived, it was around 5:30pm and Ariel was sleeping in the car. Since she skipped her afternoon nap, we decided to let her rest awhile longer while I brought the elder sister in to check out some of the activities first. The first thing that caught her attention, not surprisingly, was the colourful Kids' Corner. The first thing she wanted was to get her face painted. Right, these two girls of mine can never give this a miss or they will feel utterly disappointed. Anyway, it was an evening dedicated for the kids and I wanted them to have as much fun as they could, so I let them choose the activities that they desired. There were colouring stations, craft stations and a face painting station at the kids' corner where chaperones were on site to help out with the kids. 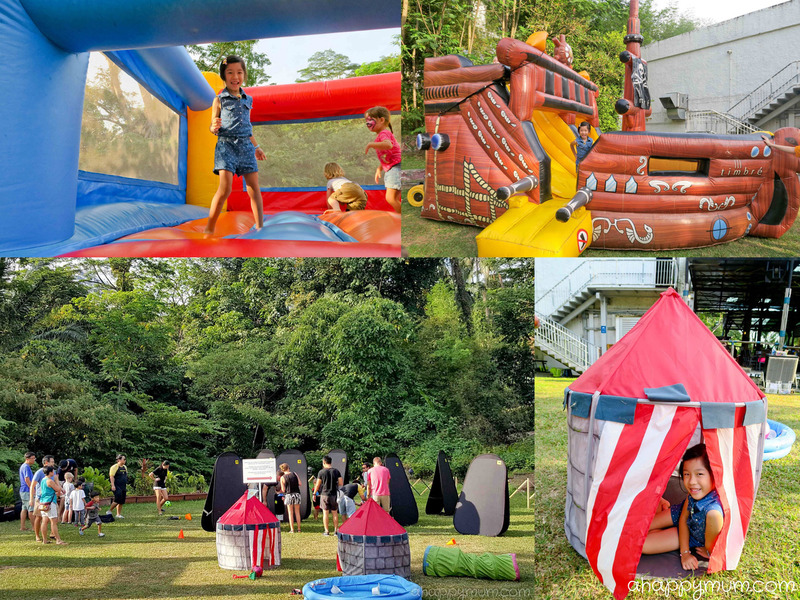 Now, if your kids prefer to run around outdoors, then you will be happy to know that there is a large lawn area filled with games, bouncy castles, tents, tunnels, bubble stations to delight the kids! Yes, do I hear 'Hooray'? The lawn is located at the back of the restaurant and there is no worry that your child will run out of the restaurant or into a road. In fact, we were able to keep an eye on our kids at all times from where we were seated. 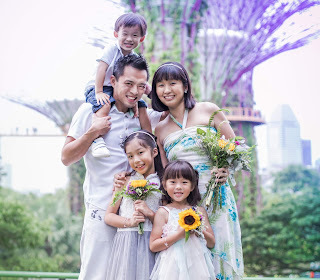 Isn't it awesome that the kids get to enjoy a breath of fresh air and take part in fun-filled activities while parents get to enjoy the live music and, for once, dine in peace? Anyway, I had to wake the little sister up soon or she would miss the activities which would greatly sadden her. 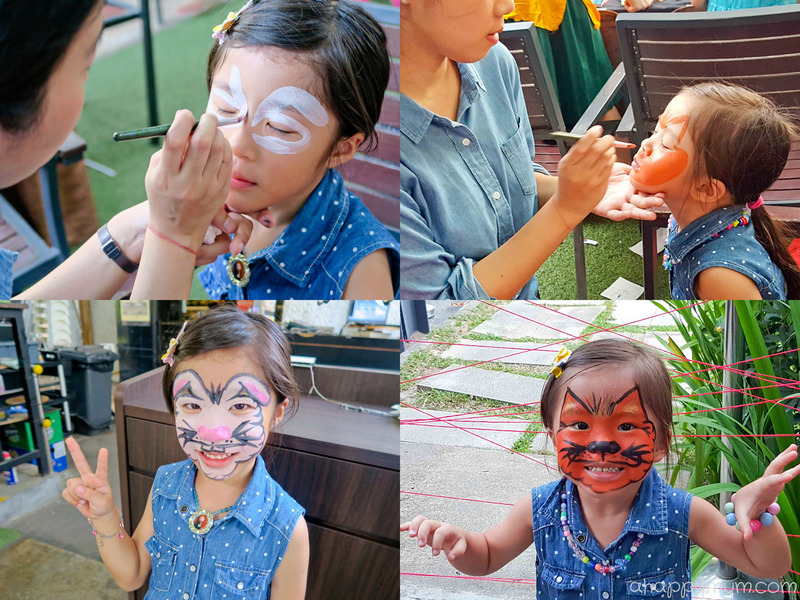 So, when she woke up, she saw her sister who by this time became a 'bunny' because of her face painting. Can you guess what was her immediate reaction? Yeah. "I want! I want! I want face painting!" I wasn't particularly looking forward to queuing up for 15 minutes again but since the station closes at 7:30pm and my toddler would not let me rest till she had gotten some colour on her face, we went to patiently queue up and wait for our turn again. She chose to be an orange cat and was absolutely happy to see the end result. Woohoo! So, is it time to sit down and have our dinner already? Wait, who am I kidding, these kids are not gonna rest till they play more, more and more! While the little one had fun on the bouncy castles, the elder girl decided to try out the shooting gallery! Yes, there were Nerf guns for the kids to play with! We totally missed the Nerf Gun War because of the sleeping toddler so hopefully you get to try that when you are there! It's a game where you get to be in teams (Red vs Blue) and you basically try to shoot your opponents! Note that it ends at 6:30pm so be sure to try it before the rest of the games. 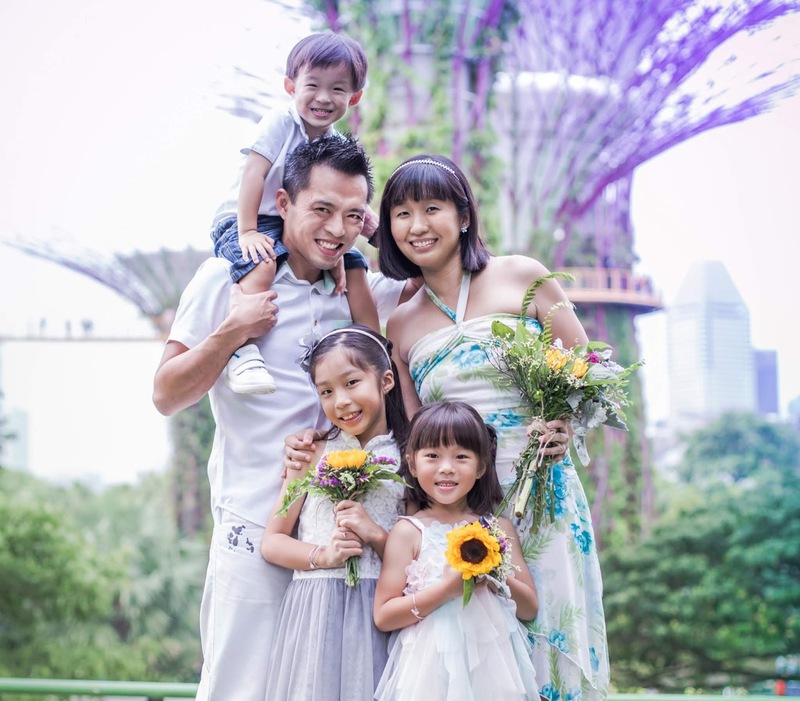 You can read more about it on A Million Little Echoes as fellow mum blogger May shares about her kids' experiences. In any case, my little girl wasn't interested in guns at all when I asked her but the big girl tried out the Nerf Gun Shooting Gallery, where you use a heavy Nerf gun to aim and try to shoot over a dozen bullets at a round target. This activity ends slightly later at 7:00pm. Regardless of which theme you are attending, my advice is to check with the staff on the activities available and the timings so that you make the most of your late afternoon and evening. Oh, in case you are wondering, the bouncy castles are here to stay for the rest of the night! Yes, at least there is something for the kids to play with all night long in case you are planning to chill a little longer! Coming to the highlight of the evening - the food! Everything was ordered through an electronic menu which made it easier for us to surf and pick out our choices. I was surprised to see that the list of food available was quite extensive and you could select from a range of tapas, salads, burgers, pizzas, fried food and of course, the BBQ menu that is only available on Saturday Social BBQ night. If there are any food items unavailable, these are clearly indicated in the menu too. We did order a dessert and waited for 20 minutes before they told us they ran out of it, but other than that, everything went smoothly and the wait for the food was not too long. Now, here's sharing with you the dishes we tried that evening. These were our favourite! The husband and I totally loved how the sweet, juicy scallops were contrasted by the crispy, flavourful bacon! In fact, we ordered two of these and still devoured every bit of them. I'm quite a lamb lover and it has become a habit to choose lamb over steak if I have a choice. That said, I regretted this decision that night because the lamb chop was a little bland and not tender enough for my liking. We heard raves about the baby ribs but while it was considered quite delectable in my view, we weren't blown away by it. I personally loved the homemade sauce while the hubby concluded that ribs were just not his kind of thing. This would be our highly recommended dish for everyone because not only us, but our kids too, absolutely savoured the dish and couldn't get enough of it. Perhaps it's because we stayed in Scandinavia for a good four or five years; the hubby and I totally loved the marvellous taste of this German sausage. There is also a kids' menu in case you are wondering, and you can order stuff like spaghetti bolognaise or fish and chips for the little ones. These are nothing to boast about and if you were to ask us, we would prefer ordering more food from the Tapas menus for the kids and fried food like chicken wings and truffle fries. Now, nothing makes a meal more fulfilling than a sweet dessert, don't you think so? Even though the list was not as exciting as we had hoped for it to be, we decided to try out a couple of the desserts. These were puff pastry with vanilla cream in them, drizzled with chocolate sauce and strawberries. I quite like the combination while my kids decided they preferred the fruits instead. Chocolate mousse topped with Chantilly creme and strawberries, I can't say I was impressed but thanks to my sweet tooth, I did finish every bit of it. Anyway, we do give the food thumbs up but one visit was definitely not adequate for us to taste as many dishes as we liked. Hopefully, we can be back again to try out the others. If your family enjoys live band, likes listening to music but doesn't wish to be in a crowded place, then this is the perfect spot for you. We were entertained by the lovely band Unified who belted out some of our favourite songs like Just the Way You Are, A Thousand Years, Someone like you and many more. If you would like to make a dedication, all you have to do is to send an SMS. Now, since it was a family-friendly Saturday Social BBQ night, you bet the band went the extra mile to make the kids feel included. Why, they invited the kids up to sing with them! My girls were totally ecstatic to be able to sing Let It Go on stage and I think the band made many little girls' dreams come true that night. If they get bored of listening to songs but Daddy and Mummy would like to chill and sit around for a while longer, then the good news is they still get to play with bubbles or jump around in the bouncy castles for as long as they like. Unlike some places that offer you a TV or colouring materials at the kids'corner, I think Timbre @ Gillman takes the word family-friendly to a whole new level. The best thing is as long as you dine here, you don't even need to pay anything extra! All in all, Saturday Social BBQ is an awesome way for families to spend the weekend and I'm really glad we came. If you are looking for a kid-friendly restaurant that serves good food, has live band performances and offers a whole lot of fun-filled activities both indoor and outdoor, do give it a try too! P.S. The upcoming theme for May will be SUPERHEROES! Online reservations can be made here. For more information, visit http://www.timbregroup.asia/ or https://www.facebook.com/SatSocialBBQ. Disclosure: We were invited to Saturday Social BBQ at Timbre @ Gillman and received dining credits in writing this review. All opinions are ours. You're a nursing mum! You need the calories!!! But ahhhhh a BBQ that I don't need to stand at and cook! Bliss!! !